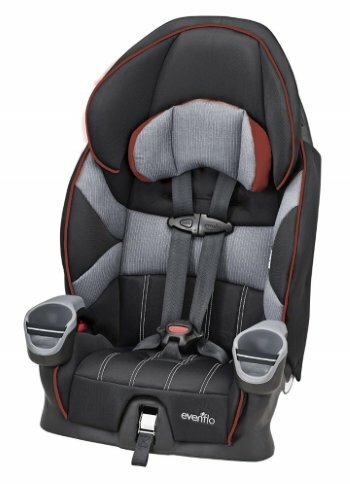 Read our 2019 detailed review of the Evenflo Maestro combination harness-to-seat belt booster car seat to see if it’s the right choice for your family. For a combination booster seat, the Evenflo Maestro isn’t particularly glamorous, but it has a lot of nice features that make it a real contender in the booster seat market. It comes in four color combinations – Wesley (gray/red), Taylor (gray/pink), Easley (dark gray/light gray block pattern) and Thunder (gray/bright blue). 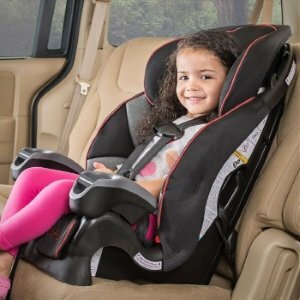 It’s designed to hold your child from the time they’ve grown out of their rear-facing seat until they’re ready to ride without a safety seat. You should be able to get quite a few years out of it. However, the height limits aren’t as generous as they could be. Compared to similar seats from other brands, the Evenflo Maestro is very budget-friendly at around $70. It comes with a 90-Day limited warranty from date of purchase and has a 6-year expiration date. Though the minimum age listed in the product description for use as a harnessed seat is 2 years old, the AAP now recommends children ride rear-facing for as long as possible. Therefore, we recommend waiting until your child has fully outgrown either the height or weight of their rear-facing seat before you switch to this one. What are the child size limits of the Evenflo Maestro Booster Car Seat? The main gripe with sizing on this seat is that there’s only one belt guide position. The head rest is not adjustable. This means that when your child outgrows the harness at its max of 18 inches, there’s not a lot of room for growth when using it with the seat belt. For kids who are tall for their age, this seat won’t last long as a booster. It’s not likely to fit to the minimum recommended age of 8 for riding in a booster. But it will probably last until age 6 or 7. Due to the narrow profile of the seat (19 inches wide), the harness straps can also have a narrow fit, which rubbed some children’s necks. Note: This seat does NOT convert into a backless booster. How big is the Evenflo Maestro Booster Car Seat, and will it fit in your vehicle? This is probably the Maestro’s biggest strong point. At only 19 inches wide, it fits easily in any position in the backseat. It helps that the cupholders are positioned straight off the arm rests instead of flared out as they do in some models. Several parents noted it fit great in vehicles from vans to mini coupes. Many were able to fit 3 seats across (including a mix of boosters/rear-facing) even in small vehicles so long as none of the other seats were overly bulky. The narrow profile also makes it an ideal seat for airline travel in harnessed mode. Several customers reported it fit well in coach class seating on various airlines. Plus at only 12 pounds, it’s not a huge burden to carry through the airport. 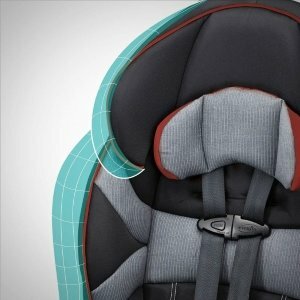 How safe is the Evenflo Maestro Booster Car Seat? Like all Evenflo car seats, the Maestro has been tested at 2X the federal crash test standard, which includes tests for side impact, structural integrity, flammability, and temperature changes. The LATCH feature on this seat can be used until your child is 50 pounds, which means it can be used in the belt-positioning booster mode. This is somewhat rare. Having the LATCH connection also keeps the seat secured when your child isn’t in it, which prevents the seat from being a projectile in a crash. When you’re not using LATCH, we recommend keeping the seat belt buckled across it when your child’s not in it. Possible flaws: Some parents had issues evenly tightening the harness straps and getting the seat installed tightly enough. Uninstalling the LATCH also proved very difficult for some. You’ll want to pay attention to your child’s growth when using this seat. Since the height limits are so low, keep your manual handy and measure your child’s height often to make sure he hasn’t already outgrown each mode. On a great note, we love hearing real customer testimonials about crash performance, as that is proof that a car seat can do its intended job. One such experience involved a complete rollover in a full-sized van. Four children were riding in Evenflo Maestro seats. The seats never budged. There were no major injuries beyond some scrapes from broken glass, etc. Note: There are a couple recalls still in effect for seats manufactured from Nov. 24, 2009 – April 10, 2010 and August 22, 2011 to October 17, 2013 for replacement reinforcement plates and crotch buckles. It’s doubtful you’ll receive a seat manufactured during that time, but visit the current recall page at NHTSA for more information. Or call Evenflo at 1-800-490-7591. 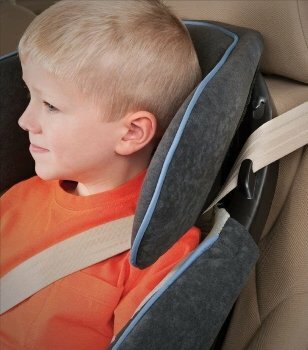 How easy is it to install and use the Evenflo Maestro Booster Car Seat? This is where this seat falls short a bit. Once you’ve gotten it in there nice and tight, it’s good to go. It’s getting it tight and then uninstalling the LATCH that could pose a challenge. Other challenges – the headrest isn’t adjustable and the harness straps must be rethreaded when moving them to new slots. Some parents also reported that the seat cover hooks come off easily and can scratch a child’s legs. Some good points – the low profile of the seat makes it easy for toddlers to climb in and out without assistance. The upfront harness adjustment is a favorite feature for parents because you can tighten or loosen the harness quickly with one hand. Elastic on the cupholders accommodates a wide range of cup sizes. Try one of these add-ons for a comfier, more enjoyable trip. This multipurpose travel tray is a one piece foldable unit that comes with a pencil bag. The surface is waterproof with clear plastic that your child can draw on with dry erase markers that wipe away easily. It has raised edges that keep pencils, crayons, snacks, etc. from falling off and several storage pockets for art supplies and more. Add an extra layer of comfort to scratchy straps with these reversible harness strap covers. Great for any time of year with plush faux shearling on one side, breathable knit on the other. 9 fashionable colors to choose from! If you travel a lot, especially via plane, this 3.5 pound specialty stroller is specifically made to carry forward-facing seats. Just click it on the stroller, put your kiddo in the seat, strap her in and off you go to catch your flight. Designed for kids 6 months – 4 years and up to 44 pounds (holds a total of 84 pounds w/ car seat). 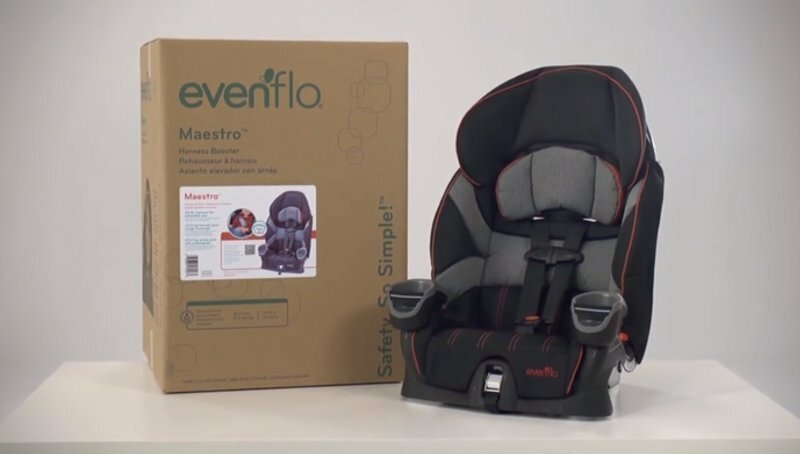 For a budget booster seat, the Evenflo Maestro is a really good option for some families. If you’re on a tight budget, have multiple car seats to fit in your car, or fly often, you’ll want to consider this seat. It would also make a great backup seat for a babysitter or grandparents. However, if you can spend a bit more and want a good everyday seat that you can take in and out of the car as needed, you might want to look elsewhere. Difficulty with unhooking the LATCH straps, harness straps that can irritate the neck and that are difficult to tighten evenly could make everyday use more hassle than help. You usually get what you pay for, and that stands in this case. We have no doubts that this can be a very safe seat when installed and used correctly. But if you’re looking for something super comfortable with quick and easy operation, you’ll probably need to spend a little more. ❮ Four Children Dead in Automobile Crashes….and that’s just today!